On Tuesday, September 14, I went to NYC to attend the opening night of the Grolier Club’s Club Bindery exhibition with accompanying catalogue Bound to be the Best–The Club Bindery: Catalogue of an Exhibition at The Grolier Club by Thomas G. Boss with an Essay by Martin Antonetti (Boston, Thomas G. Boss Fine Books, 2004), a copy of which was earlier inscribed to me: “For the Prince of Mosher Collectors Philip Bishop from his friend Tom Boss — The first inscribed copy, 1 September 2004.” Among the fifty plus bindings on display were three of the bindings I sold directly to Thomas G. Boss over the years: catalogue entries No. 1, 36 and 58 (Smith & Mansell binding on William Matthews’ Modern Bookbinding Practically Considered–which bookseller David Block told me that in his estimation it’s the finest binding represented in the exhibition–, a first edition of A.C. Swinburne’s Atalanta in Calydon, and David Grayson’s Adventures of David Grayson respectively). Another two-volume set also present was once owned by me and eventually found its way to monsieur Boss: catalogue entry No. 2, Grace Wharton’s The Literature of Society. It was simply wonderful to see those “old friends” once again and to know that in this small way I contributed to the august Boss collection formed over a 20-30 year period. And what a delightful evening which culminated a rather long day because I had to drive one-and-a-half hours to Kutztown, PA to get a motor coach which then took me to NYC. I left at 10:30 AM and got back home at 11:30 PM. The hors d’oeuvres and wine served at the opening were my only “meal” opportunity. No complaints, however, everything was scrumptious and the four glasses of wine certainly lubricated my mental and physical wheels. Before leaving I visited the cases one last time and lifted my last glass of wine to each book I once represented while murmuring a few fitting words of tribute. Likewise I lifted my glass to each of the exhibit’s two Mosher books printed on vellum and superbly bound by the Club Bindery, and at the end of it all lifted my glass one last time at the reception desk while looking into the exhibit room. My god, after the passing of a few days I am still awe struck by what a collection is exhibited there at the Grolier Club. When one is a bibliophile of the bibliopegic persuasion, such sights are hard to get out of one’s mind. As mentioned above, two of the Club bindings exhibited are on Mosher books printed on real vellum. I’d love to have them, but have just about resigned myself to their never coming into the fold of the Mosher collection. Taking breaks from the books themselves, I’d walk about the loquacious crowd and talked with the book designer Jerry Kelly, the head of the Avery collection at Columbia University–Claudia Funke, spoke with the great 1890’s collector and past president of the William Morris Society of the U.S.–Mark Samuels Lasner, and had a fun time with the columnist Gary Shapiro who writes for The New York Sun (amazingly he already knew about Mosher being born and raised in Maine himself), who mentioned me as “Philip Bishop of Mosher Books in Millersville, Pa., who contributed four bindings to the show” in the Thursday, September 16 issue of The New York Sun in his article entitled “Bound for Glory” (p. 16). I also noticed the bookseller Jim Cummins milling about, said hello to the noted collector Bill Boice to whom I‘ve sold a few books, had a brief discussion with the Grolier Club librarian Eric Holzenberg, and had chats with a couple collectors whom I never met before and would probably never meet again. These were just a few of the many high powered collectors present at the evening’s festivities and quite frankly I felt like a lightly outfitted cruiser amid so many gray-haired battleships. But perhaps the nicest exchange I had was in meeting Dominique Desmonts. Young Mr. Desmonts is the son of Jacques Desmonts who for many years was the custodian of a significant portion of the Club Bindery’s tools and equipment while he worked for the James Macdonald Bindery of New York. Dominique’s father couldn’t attend the opening because he had to attend to business in France, so his son was sent as his representative. I told young Messr. Desmonts that it was wonderful for him to attend in his father’s stead, that we were honored, and that his father certainly would have been quite satisfied to see all these binder’s tools and pieces of equipment on display. Likewise, it was evident that the son took pride in seeing the outcome of his father’s stewardship. It certainly is quite a sight to see all those brass plate dies, hand- and roll-tools, and wooden tables and holders accompanying the exhibit along with the original Desmont labels assigned to them. Of course these now belong to Kenneth W. and Shirley McNerney Rendell. 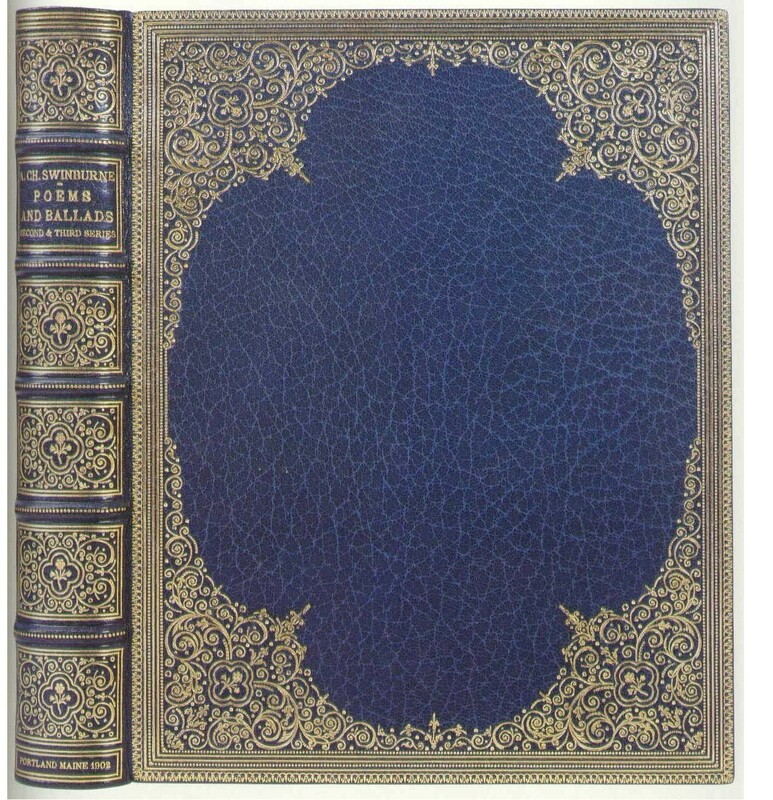 The exhibition contains just a small fraction of the approximately 2,800 nineteenth century binding tools from the Club and Macdonald binderies sold at Christie’s East on April 12, 2000 for a mere $350,000 plus buyer’s premium. I’m told they almost were sold to someone in France, but the Rendell’s saved the day and kept them in America. I also had a spirited talk with Martin Hutner, the noted Merrymount Press and James McNeill Whistler collector and past president of the American Printing History Association, while walking down the sidewalk from the Grolier Club. Just before parting for the subway he gave me a hug which somewhat surprised me. Our conversation touched upon some of our pet peeves with regard to book collecting vs. the modern technological world with its Internet and cell phone manifestations. He also very much appreciated that I asked him for an inscription in his Whistleriana catalogue from last year’s exhibit which I had in hand and which he signed “With admiration and affection to one of America’s fine booksellers. Martin H.” as I afterward read. That makes me smile a little, partly because it was so personal, and partly because I don’t see myself as “one of America’s fine booksellers,” but Hutner’s sincere sentiments are nevertheless to be enjoyed and appreciated as coming from one who is widely known as a true bibliophile. Apparently our conversation also impressed him in the longer run, for several days later he called me to let me know that I “made” The New York Sun article (a copy of which he later sent to me), and to ask me if I’d possibly serve on a discussion panel on modern printing to be held at The Grolier Club sometime during 2007. My how that evening’s influences have continued to unfold. The foreword was written by Don C. Seitz, who wrote the first Whistler bibliography, also in this exhibition. Thomas Bird Mosher’s sobriquet, ‘The Passionate Pirate,’ could not have been more apt. He was passionate about Whistler, about art and about literature, and pirated works which he offered to the public, beautifully printed and at a fair price. [and in the following note:] All in all, Mosher printed five editions in nine years. The latter note is not altogether accurate in that Mosher himself had the Whistler title printed only three times in 1916, 1917, and 1920, and his assistant printed it once more (in 1925) after his death. Ah, but I digress with matters pertaining to last year’s exhibit when it’s this year’s Club Bindery which should presently be the focus of attention, so back to my notes on the exhibit. In reading what I’ve already written above, I’m struck by how it paints me as a rather social being flitting from person to person, “name dropping” as though to bolster my self-importance by recording that I hobnobbed with such folks. To be perfectly honest, I might sound like the gregarious type, but I was really only there for only one thing: the books and the books alone. They were the object of my attention. The others were hurdles I had to move around or over, sometimes quite literally, like when I had to ask the bar tender if she would excuse my walking behind her to be able to see a section of the exhibition otherwise cut off by her and the crowd. I put myself in “the midst of it” so to speak and felt the silent call, the beckoning, of the books. They were the true object of my attention that evening. And when toasting the books, it did pass through my little pea-brain that if anybody was watching they’d think me some sort of nut who somehow got past the seraphim protected corridor into an inner sanctum of The Grolier Club, but the thought quickly evaporated when I snapped back to my usual attitude of disregard which I more frequently assume these days. It was just the books with which I wanted to commune, and the business attired others–myself included–were slightly occluding that task. I also realized that those folks were just so very busy being either full of themselves, or to attending to their own self-interest, or wanting to see and be seen. It was a social event. For me, it was an event of internal connection, of sympathy with these precious relics passed down through the years, of relishing the moment during which I was privileged to see what otherwise would have been held from eyesight of only the most well heeled collector. I was full of them, the books, and touched by the precision of adulatory workmanship which surrounded the fineness of each beautifully printed text. The heart of the Club Bindery exhibition, for me at least–aside from re-visiting the beautiful bindings that I had once owned and sold–was the two Mosher books printed on vellum and bound by the Club Bindery. 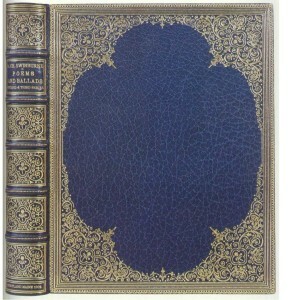 The largest of the two was the 1902 Poems and Ballads by Algernon Charles Swinburne, one of just four copies printed on real vellum with this particular copy bound in 1904 in full medium blue crushed levant morocco and highly decorated around the covers and on the spine (entry No. 30 on p. 39). It carries the bookplate of Henry William Poor and actually might have (should have?) come in my direction for purchase. It was bought by Ric Zank of Blue Mountain Books along with a large collection. I remember a couple years before Ric and I walked about a book fair we were both doing and we talked at length about his quoting me good Mosher material which he promised he would. Time has a way of erasing memories, and when this really good Mosher item finally did surface, Ric’s first reaction was to pass along the Poems and Ballads to another bookseller who immediately took it to Tom Boss. At least the book went to a good, and fittingly appropriate collection, but I still regret that Ric hadn’t remembered our conversation so as to quote me the first significant Mosher book he came across since our understanding. So there it was, behind the exhibition glass with me standing outside and staring into the case with the thought of what might have been. Oh well, no use crying over spilt milk. The other Mosher book in the exhibit was No. 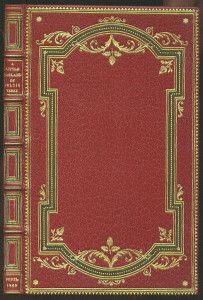 33, A Little Garland of Celtic Verse (1905), one of ten printed on real vellum and bound in the same year by the Club Bindery in full crimson crushed levant morocco with gold tooling and inlays for Henry William Poor and later acquired by Cortland Field Bishop as both men’s bookplates proudly testify. These owners were real powerhouse collectors of the early 20th century, and Tom Boss is likewise a powerhouse collector of Club bindings in the 21st. What a magnificent little specimen of the bookbinder’s art! During the evening Tom and I briefly discussed the two bindings and he mentioned that in his opinion Norman Strouse had all but depleted the available market of Mosher books in Club bindings. I tended to agree, of course, and only added that what Strouse failed to completely do, Boss completed. For me, personally, I’m not sure if I will ever be able to acquire even one Mosher book in an elaborate Club binding. 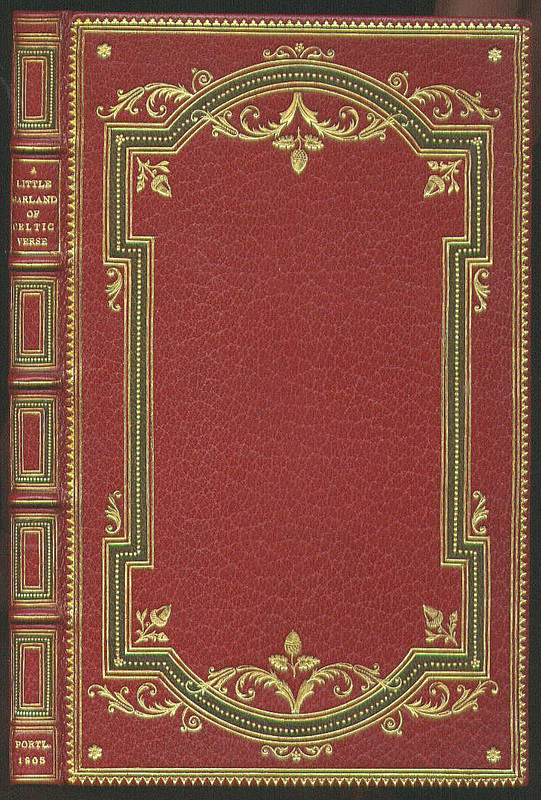 This is somewhat ironic since I acquired the Smith & Mansell, the Club binding on the Atalanta in Calydon, the “French Binders” binding (successor to the Club Bindery), and once owned that two-volume Wharton set, now all in the Boss collection and on exhibit at the Grolier Club, but never managed to get even one for myself. And will there ever come a time that Boss might tire of the bindings and sell me one? Well, certainly not in the next five years because any Grolier Club member who has an exhibition of his or her books has to sign an agreement that no item from the collection, nor the collection itself, may be sold in the next five years. And after that? Who knows. Maybe there will be an opportunity, but somehow I rather doubt it, yet stranger things have happened and I’d be the first to admit that when the possibilities seem almost nil, something seems to occur to fly flat against my pessimistic prophesies. And if not from Tom Boss, then someone else might miraculously find and offer me elaborate Club binding on a Mosher book. We’ll just have to wait and see–won’t we?